Light Efficient Design UK Ltd explains the unique design of its LED corn lamps offer an alternative to traditional corn lighting. Light Efficient Design UK Ltd offers superior design for retrofitting into low-bay, floodlights, and high bay fittings. 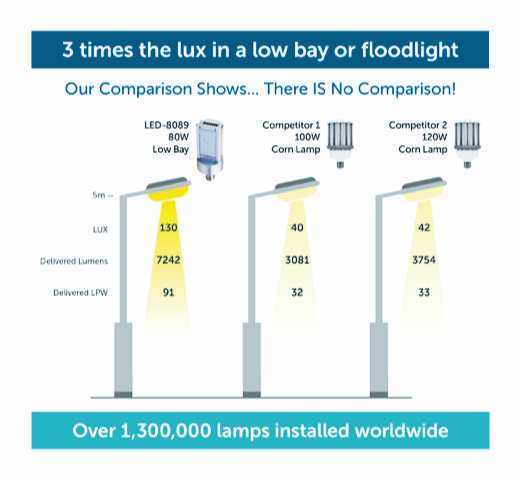 The unique lamp shape can deliver up to three times the illuminance when compared to a standard corn lamp – see graphic above. Take its 4,000k and 5,000k LED-8089 80W and 8090 120W retrofit models. They deliver maximum light output when replacing 250 to 400W HIDs in low-bays, high-bays and floodlights. The one-sided LED design ensures users benefit from clean, bright light (>80 CRI) right where it’s needed, while saving up to 70% in energy costs and emissions. All Light Efficient Design retrofit lamps come with active cooling, thermal feedback and a five-year warranty. Importantly, they can be used in enclosed fittings, which is not the norm for most other products on the market. LEDUK Ltd products are fully CE/ROHS compliant and LM79 LM80 data is available to provide users with genuine photometry. Light Efficient Design UK’s Newbury-based warehouse offers prompt delivery to UK/Ireland electrical wholesalers and help is available through a national network of lighting sales engineers and electrical wholesalers. Contact Light Efficient Design UK for a free 60 trial.